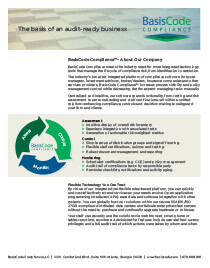 BasisCode Compliance, provider of the industry’s broadest integrated compliance software for asset managers, advisors and other financial services firms, has been named a finalist in the compliance technology category of WealthManagement.com’s 2015 Industry Awards, the first program to honor outstanding achievements by companies that help advisors better manage their businesses through innovation, enhanced service quality or an enriched advisor/client experience. 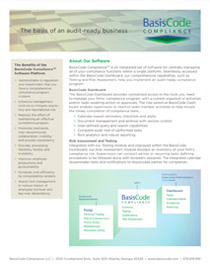 The BasisCode Compliance™ software spans functionality, from compliance testing and risk assessment to personal trading and certifications—all within a single unified platform. The BasisCode Dashboard displays a consolidated inventory of a firm’s risk exposure while offering seamless access to a comprehensive set of compliance management tools. The BasisCode Portal engages non-supervisory staff, such as registered representatives, in helping firms maintain a culture of compliance. From hundreds of award nominations received, 95 finalists were chosen within the following categories: asset managers, broker/dealers, custodians, disruptors, insurance, non-custodial RIA support platforms, social media, TAMPs, thought leadership, and technology innovation. An expert panel of judges from leading industry organizations determined the list of award finalists. A survey of more than 850 financial professionals across advisory channels also helped determine the list of finalists. Winners will be announced at an awards ceremony in New York City on September 24. 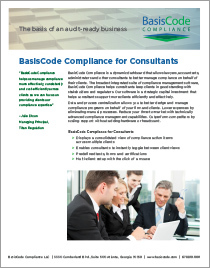 BasisCode Compliance offers the industry’s broadest set of integrated software that improves compliance management for asset managers, investment advisors, broker/dealers, insurance companies and other financial services providers. The intuitive BasisCode Compliance software spans functionality, from testing and risk assessment to personal trading and certifications—all within a single unified platform—enhancing compliance controls and decision-making for financial services firms and their clients.